You enjoy sitting comfortably in your recliner while using your laptop, right? What if I told you that you can do that sitting even more comfortably? 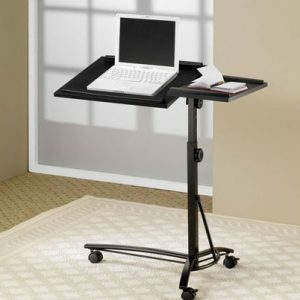 The way to do that is instead of holding your laptop on your lap, use a recliner laptop table. If you have less than 3 inches of clearance, buy this model. It only needs 1.2 inches of clearance. The other two won't fit your recliner. The price is low, it is sturdy, and it has amazing reviews. The laptop table needs 4 inches of clearance, please take this into consideration before buying. It only needs 3 inches of clearance. Looks wise, it is a little bit ugly. What is a recliner laptop table? A recliner computer table is a piece of furniture that will help you avoid holding your laptop on your lap while sitting in your recliner, armchair or sofa. Not only that will keep your device from heating up but will make your sitting position more comfortable than before. 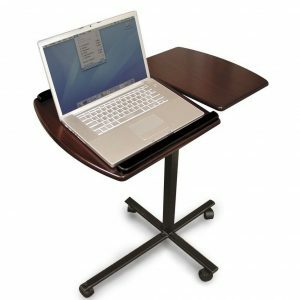 Why should you buy a recliner laptop table? Your laptop will not heat so fast as without a tray table. Heating can cause damage to the device. Also, it gets a bit uncomfortable to hold something hot on your lap, as I am sure you are perfectly aware of. You can comfortably watch a movie while relaxing in your recliner. Without a tray table, you have to hold your laptop. That means you cannot move without moving the device. Also, you don’t have as much liberty to have a snack. One of the things that annoy me when I’m using the laptop while sitting in my recliner is the bathroom breaks. Every time I have to put down the laptop, or in a safe place so I will not step or sit on it by accident. With a recliner laptop table, that problem disappears. You just push the table away from you when you get up and pull it back to you when you sit back down. I find it much more convenient than the old way. It’s comfortable in general. Most models have wheels so you can move them from one room to another. You can also put it beside your bed if you want to use your laptop there. You can use it as a breakfast table too. In the morning you can enjoy your coffee sitting in your favorite chair without fearing that you will spill your coffee all over yourself if you take a wrong turn. Fortunately, there is no shortage of recliner computer table models. You can find them in all shapes and sizes, but only a few are close to perfect. Here are three of them I found to be the most satisfactory. This product has a modern design and is fully adjustable. No matter how big your recliner is, this product will fit. The tray rotates 360º, which makes it easy to put your laptop aside. Instead of moving the whole table, you just have to pivot the tray. Also, it can tilt 35º. That makes it incredibly comfy to use and prevents you from sitting in an unhealthy position. What I love the most about this recliner laptop table is that it is symmetric. If you look online, you will notice that almost all recliner computer tables have the mouse space on the right side. They are destined for right-handed people, which is not fair. However, this model is for both left-handed and right-handed people. You can rotate the tray according to your preference. It’s brilliant. Space you need under the recliner needs to be only 3 cm high, and the base will enter swiftly under your furniture. The metal structure makes this tray table very sturdy long-lasting. It’s a little bit more pricey than other products from this category, but in my opinion, it is worth it. Click here to check prices. This is a simple, but beautiful and elegant, model. It is perfect for small places. When you don’t need it anymore, you can just put it away in a closet. Its compact design will make it easy to store. The height is fully adjustable. It can vary from 30 to 40 inches. That way you can use it beside your recliner, as well as your bed (if it is taller than the chair). The wheels make it very easy to move around the house, even if it’s not that heavy. The design is very pleasant and eye-catching, but there is one thing I noticed and may cause some issues. Apparently, you need a space of around 3 inches under the recliner so you can easily slide the laptop table. It may not be a problem for many, but there are recliner models that do not have that much space, which means that this table is not suited for them. Just a thing to pay attention to. Click here to check prices. This may be the most simple recliner laptop table you will ever find (that is not a hospital table tray), but somehow the design is very attractive. Like all other recliner computer tables, this model is adjustable from 24.5 inches to 33.75 inches so it will fit all recliner and bed heights. The tray will tilt so you can sit comfortably and avoid back and neck pains. The wheels make this tray table portable, even though it’s not difficult to carry 15 pounds. Just like the previous model, you need at least 4 inches under the recliner or sofa to place this tray table. It may be problematic for some, so make sure that when you want to buy such a product you measure carefully the space where it will go. Click here to check prices. Although all models are worthy of your attention, I personally like the first one, the Coaster laptop table. I believe this is a big plus. Also, the design is fantastic, and the material is made of looks really sturdy. The posture prevention feature is a huge advantage. 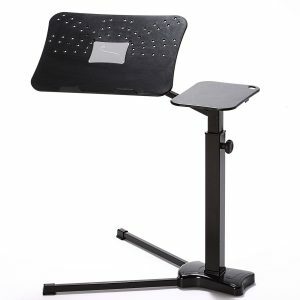 Easy to install and the fact that it is extremely versatile make this recliner laptop table one of the best ones on the market. If you have less than 3 inches of clearance, get the Lounge-Book — it needs at least 1.2 inches of clearance. Click here to buy the Lounge-Book.